Office Depot Clean Seal(TM) Security Envelopes, #10 (4 1/8in. x 9 1/2in. ), White, Box Of 500, 12015Don't let the thought of licking envelope adhesive ruin your day. Office Depot security envelopes can simplify your task. These 10 envelopes offer a convenient peel-and-seal design that requires no moisture. 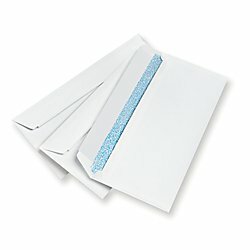 Self-seal envelopes are ideal for all general mailings. Security-tinted inside for privacy and confidentiality. Made of crisp 24-lb white wove for a substantial feel. Durable 2-sided seam construction resists tearing. Large box of 500 envelopes ensures you will have plenty on hand.